When you move into a new house or begin a long-overdue renovation on a room in your current home, there are certain things that tend to go first. Old carpet usually tops the list. Outdated paint colors are usually a pretty close second. And there are those fixtures that always seem clunky and dated—like the ceiling fan. When you first think of ceiling fans, what image pops into your mind? Is it an awkward, dust-covered, utilitarian white ceiling fan? 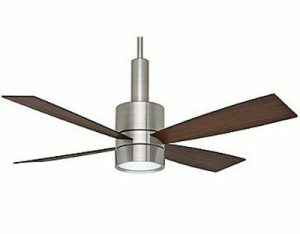 Or perhaps the long, angular wood grain blades and medal chains of the 1970s ceiling fans that still exist in many contemporary houses? If you’re tempted to rip out your ceiling fan and replace it with a static light fixture, you might want to reconsider! Ceiling fans have come a long way design-wise, meaning you can keep your room cool without having to sacrifice style, thanks to brands like Casablanca ceiling fans. Casablanca ceiling fans and other similar contemporary brands are about as far as you can get from the ugly, fussy, awkward ceiling fans we’ve all come to know. Think elegantly curved blades, architectural shapes, and smart designs that reduce noise. Your Casablanca ceiling fan can match the style and personality of your home, whether it be contemporary and minimalist, mid-century modern, warm and traditional, or anything else in between. Being able to choose features like the number or width of the blades allows you to use your new ceiling fan to inject a little personality into your home. Ceiling fans have not only advanced in their overall appearance; there is also more of a variety available now. Whereas you used to be limited to a couple of basic models, you can now select a shape, color, and material that fits perfectly with the style of your home. There are options that feature bolder designs, which are intended to stand out and make a statement. There are other styles that are more conservative and minimalist, allowing the fan to blend into the background a bit more so you can choose to use it more for its function that for its looks. Whatever your preference is in terms of design and function, you now have the options to support that with Casablanca ceiling fans (http://blog.crescentharbor.com/add-style-home-casablanca-ceiling-fans/). Ceiling fans do exist for a reason. As ugly as some of the older styles are, they really are a practical choice, especially in homes that don’t have an air conditioning unit installed. To go from having a ceiling fan to being stuck without one during those hot summer days will not be a pleasant adjustment. Casablanca ceiling fans add a welcome decorative flair to your home, while preserving the practical function of a ceiling fan. If you’re ready to update your home and your old ceiling fan is the first item on your list of things to go, pause before you decide to replace it with a static light fixture. Here at Crescent Harbor (http://www.crescentharbor.com/), we have stylish, contemporary options from brands like Casablanca ceiling fans that allow you to preserve the convenience and function of a ceiling fan—without sacrificing style, design, and personality. Check out our selection today.